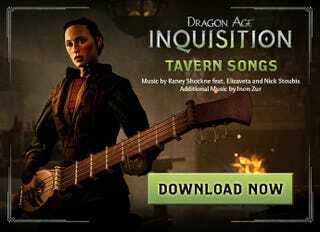 Did you play Dragon Age: Inquisition and love the tavern music as much as I have? Then you're in luck because BioWare has just made the songs available for free (and DRM-free) before they hit digital storefronts in two weeks! Go to BioWare's Dragon Age site and download the ZIP file. You don't even have to log on to your EA account to download the songs. And in a typical BioWare fashion, the company has included the sheet music along with the songs so that you can perform them yourself! UPDATE: According to commenter Desregoth, visiting the French language site will let you download the French version of the songs heard throughout the game.